2014 World Cup qualifications :teams that qualify for play-offs ! play-offs WC 2014 2014 World Cup qualifications :teams that qualify for play-offs ! 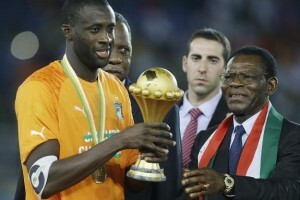 Algeria, Egypt and Ivory Coast secured their berths back in June, Ghana did so on Friday. Cape Verde, Burkina Faso and Ethiopia qualify for third round. The last remaining place will be decided on Sunday when Cameroon host Libya with the home team needing a draw and the visitors a win. The draw for the playoffs is in Cairo on September 16. The 10 teams will be drawn into five pairings for two-legged ties.The matches will likely be played between 11-15 October and 15-19 November 2013. The five teams that win their respective ties will qualify for the 2014 FIFA World Cup™. If scores are level after the second leg the team with the most away goals qualify, whether after 90 minutes or extra time.